Four-person vehicular mayhem for iOS. Outside of Remedy Entertainment's Death Rally, people don't have much in the way of vehicular combat games on iPhone and iPad. Glu Mobile is very much aware of this, and filled the need for such titles with one of its own, an app called Indestructible. While not as ambitious as more high profile hits in the genre, most notably Twisted Metal on Sony consoles, the publisher succeeded in delivering explosive online multiplayer mayhem, where the first person to five points wins. Definitely room for improvement, but considering it's free, a good start all the same. 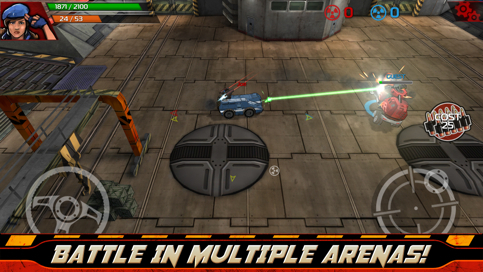 With support for up to four gamers, Indestructible is all about keeping up with and then surpassing the opposition by playing and hopefully winning as much as possible, whereupon which you earn coins that come in handy for buying more powerful rides and perks that enhance your vehicle, be it a Modified Loading Mechanism that increases explosive weapon rate of fire by five percent, a Modified Intake that boosts acceleration 10 percent or Steel Window Armor that adds 500 additional armor points. Buying all these things is tantamount to success, as the game doesn't cherry pick opponents based on someone's current level, but instead, throws everyone together. In other words, beginners easily succumb to the might of their higher-level adversaries. Therein lies one of the game's biggest issues, that being the cost of things. It takes 7,500 coins to acquire the second available car, the Mantis. From there, it's gold bricks the rest of the way, which are incredibly tough to come by without spending real world dough via in-app purchase. Tier 1 pieces of equipment are cheap enough, but the good stuff doesn't become available until you've achieved specific levels, forcing you to grind like crazy. At least on the positive side, Indestructible has more than enough fun to spare. 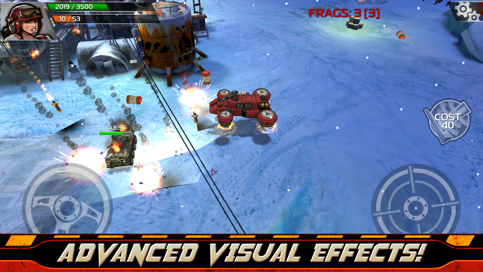 It takes less than a minute to connect online, and the game's three modes (Deathmatch, Capture the Flag, Recover the Charge- locked) result in players frantically steering their way through three different environments, snagging power-ups for more health/double the damage while making use of their vehicles' unique abilities, a list that includes landmines and air strikes, to name a few. The controls, however, take some getting used to. Basically, you have two virtual wheels on opposite ends of the screen. The one on the left handles steering, and is by far the more difficult to adjust to. The other, on the right, lets you fire 360 degrees; simple enough. Thankfully, it shouldn't take longer than five, maybe 10 minutes to adjust. On that note, Indestructible is a game we think you should look into. More vehicles, weapons and arenas would be nice, and we'll likely receive them from Glu in future updates, but in its current form, the game will definitely keep you fragging for hours, or just a few minutes a day. Not as feature packed as Death Rally, but remember, that game took over a year to become the stud it is today. We can only hope Indestructible follows a similar pattern into 2013. What's Hot: Relatively seamless online multiplayer matches, support for up to four players at once, a variety of cars and equipment, free-to-play. What's Not: Disproportionate ratio between vehicles that cost coins and gold, only three arenas, prepare for a ton of grinding.